English Springer Spaniel The showstopper! One of the world’s best show dogs, English Springer Spaniels are intelligent and fun-loving pooches…eager to be an inseparable part of your family. “I have been blessed with many wonderful Springers over the past forty years. My first was perhaps my most special. He was born in 1972 and went home with me when I was just twenty years old. He became my best friend and constant companion, my bed dog, my protector, puppy raiser, and my ticket into the world of the English Springer Spaniel. He finished his Championship at a year old, on my 21st birthday, and went on to be a multiple Best In Show dog and the sire of 66 champions, which made him the top producing black and white sire in the history of the breed. Another world was opened to me in the early 90’s when I sent Am. Ch. Ocoee Raven’s Child to Australia. She was the first ESS female CH ever exported from America to Australia. Sine then, there is no looking back, yes, I am in love with the English Springer Spaniel,” tells Kathy Lorentzen, a well known breeder of English Springer Spaniel. The English Springer Spaniel is a moderate-sized sporting gundog. He is a member of the flushing spaniel family. Their origins are based in the old ‘setting and springing’ spaniels, which were eventually divided into the Setters and the Springer Spaniels. Hence, they are the tallest and longest legged of the flushing spaniel breeds. They are compact, medium-sized dogs with a proud expression. “Springers are one of the most beautiful breeds. Their long, lean heads with deep set, dark eyes are stunning and their glossy, flowing coats make them a show-stopper,” says Kathy Lorentzen. English Springers can be found in different colours like liver and white, black and white, white and liver, white and black, with or without ticking and roaning, and with or without tan tri-colour markings. The average height of a male English Springer is 18–20 inches and weight is 23–25 kg while females are around 17–19 inches high and weigh around 16–20 kg. English Springer Spaniel is one of those breeds who have extremely different types of show and field dogs. In other countries the separation is not as distinct, but in America and England the two types are rarely, if ever, bred together. The field-bred dogs are selected totally for performance, while the show bred dogs are selected for conformation according to a breed standard, health and temperament. Field dogs tend to be more refined, with far less coat. They have been bred to be a speed dog rather than an endurance dog, which is what the ESS was originally meant to be. Field dogs also tend to be too ‘hot’ in temperament for the average pet owner because great desire has been bred into them for generations in order to get the fastest and boldest hunting performance out of them. While there are lines of show bred Springers who are very successful hunting companions, there are no lines of field bred Springers who are successful in the conformation show ring. There also are no show bred Springers that compete in actual field trials, but they do compete successfully in Hunting Tests. Springers are happy, outgoing and intelligent dogs who need a lot of human interaction. They are agreeable and easy to train but do not do well with any sort of heavy-handed discipline. But, they respond well to a positive reward system. English Springers are wonderful family dogs. They love children and love to be a real part of the family. The only thing that pet parents need to be careful about is making sure that the dog knows, he is not the alpha in the relationship. “Perhaps their most striking characteristic is their sense of humour and innate desire to please their people,” adds Kathy. Walk, run and play with me! 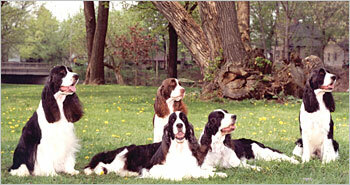 Springers are active, especially as puppies and adolescents. “They should have access to a large yard to run and play in, or should be taken for several walks a day if a yard is not available,” advices Kathy. Springers are always up for games. They are natural retrievers, learn tricks easily and most of them love to swim. “Raising a Springer puppy is no different than raising any other puppy, they should have a crate for naptime and mealtime, a regular schedule of going outside to learn to be housebroken, and a puppy training class to learn basic manners. Also, they should be exposed to children as puppies to make them fond of them,” tells Kathy. Springers grow a fair amount of hair and need to be brushed weekly, bathed frequently and trimmed at least four times a year. Their head, feet and tail should be trimmed and their topcoats stripped. “For people not showing their dogs, their backs can be clipped and their feathering shortened to make it easier to take care of,” Kathy gives a sound advice. They shed a lot of hair. “They are a double-coated breed, and rotate coat on a seasonal basis, but if kept brushed and combed, the shedding will be minimal,” she adds. As in any breed, English Springers too have their share of hereditary issues, which include hip dysplasia, elbow dysplasia, retinal dysplasia and retinal atrophy. Springers can also be prone to skin and ear problems. http://www.dogsandpupsmagazine.com/wp-content/uploads/2009/09/breed011.jpg 134 250 Dogs and pups Magazine http://www.dogsandpupsmagazine.com/wp-content/uploads/2017/05/1254nal.jpg Dogs and pups Magazine2009-09-21 00:00:002014-02-07 17:40:33English Springer Spaniel The showstopper! The very name of the breed conjures up visions of strong muscular dogs running over large extent of meadows and down after a fox. It also brings pictures of men on horseback and loudly yodeling “Tally Ho!” when a fox was sighted. But English Foxhounds are much more than that! You need to own one to know their true potential. I have never been to hunting, so never knew what was in store for me when the first Foxhound came into my life in 2005. That was Glory, a four-month-old pretty girl Foxhound. She immediately decided that she should be the centre of our lives. She had a loud voice and expressed herself very clearly. One day, I took my older dog, a Pointer called Lava, for a walk and left Glory in the garden. And you won’t believe she howled, yelped, cried and brought all the neighbours running, thinking somebody was slowly strangling her! Since then, I never left Glory behind…that’s how she became the centre of our lives. Glory was a good learner and a teacher too. She taught me that Foxhounds are contrary animals. On a walk, if I pulled the leash to left, she would go right. And if I pulled harder, saying “I am your master, listen to me”, Glory would pull a lot harder and finally lie down on the ground. I learnt quickly and understood that she and all her kin were different. Some people call them stubborn because these people do not understand the Foxhounds are just different. They are scent hounds and their view of the world is through their noses. If we are at kindergarten level in smelling, they are near a Ph.D! A walk is more of a smell-athon, nose to the ground, zig zagging, following a scent trail, which is invisible to us poor human nostrils. They can easily clamber over a five-foot fence and follow their noses. And sooner than I expected, other Foxhounds came from different parts of the globe. And I was to discover that there are about only another 10 breeders (or so) in the world. That makes it one rare breed. When the American Kennel Club registered several thousand Labrador Retrievers in one year, they registered only a few dozen Foxhounds. The Hunts in UK and other countries have closely guarded this breed and very few specimens have come into private individuals. Over centuries, mankind has bred and evolved various hunting dogs. The English Foxhound came from several breeds including the St Hubert Hound and may be even the Grey Hound. They were evolved to hunt foxes in the English countryside. The pursuit and hunting of foxes later became a pastime for the nobility and landed gentry of the British Isles. The Hound was to have great endurance and a loud voice to call out to the hunters who followed on horseback or on foot. Several strains evolved depending on the type of land that the hunt was taking place. These included the Old English, which were stockier and low scenting; the Modern type which were taller and the Fell Hounds, which were hunted in the hilly terrain. A type called the Woolies evolved with a thicker coat. The English Foxhounds are held and guarded closely by the many Hunts in the UK and elsewhere. Very few are seen in dog shows worldwide. India had many Hunts during the colonial period. With the ‘sport’ falling out of favour after independence, most Hunts wound up and the last one is in Ooty, where the Hounds and horses ride into the downs and nothing is hunted as hunting is banned by law. They are medium-size dogs and full-grown males weigh about 40kg and females slightly less. They are built like their smaller cousin the Beagle, except bigger in size. In a dog show, a visitor commented quite knowledgeably to his friend, while pointing at my Foxhound, “That is just another Beagle, he just fed her too much, she has grown so big”. I had a good laugh. English Foxhounds are found in different colours like white, black, tan and also the pied variety. They have floppy ears which fly when they are running full tilt. And run, they really can. When I introduce the Hounds to friends they take to them very well. Even children visiting us take to these wonderful animals. They are not biters or never show aggression in front of strangers. I live with seven of them and its glorious to watch them play. They play rough but rarely do fight. Foxhounds are pack animals and have been bred to work with other dogs and humans. This is a trait that is ingrained in their genes that if there aren’t other dogs in the household they take the human family as their pack. After a good exercise they are just as happy lying down nearby and being next to their human pack. They do not do well, if they are boxed in a small cage all day long without sufficient stimuli of humans or dogs. These are intelligent animals who want a good reason on why they should do something. And when they start to understand and do things, it is wonderful. They will not blindly follow commands unlike some other breeds. They can easily work out things like: “How to dig under the fence”, “How to open the fridge door” and best of all “How to train the master, to do things they like”. They do very well in Clicker Training—a fantastic system of positive reinforcement. A young pup may be happy with loads of playtime plus a walk of a few kilometres twice a day. But after they attain one year of age, they may need runs and jogs. The runs should be in enclosed or fenced areas or on leash if on a road. They should never be allowed to run freely in open roads and places. Being scent hounds, they will just follow their nose and run, which it can land them into serious trouble. If started early, they can be trained to run next to a cycle. A Foxhound pup needs as much love and affection that he can get. Also some firm handling is good for them, but not military style commands. This is just to ensure that they learn early that certain behaviours are acceptable while others are not. Remember, we are their teachers, parents and pack, and we have to play that role well. A solid run of around five km and your English Foxhound takes a short breather and wants to play some more. They are high energy dogs who need a good amount of exercise. They won’t do well if they are asked to be couch potatoes all the time. A leisurely stroll simply won’t do. Grooming a Foxhound is simple—a rubber glove couple of times a week is good enough! A nice bath once or twice a month is adequate. If the dog is walked and run properly, his nails don’t need to be cut. But the teeth may need attention. Regular brushing with a doggie toothpaste is a good thing. They shed as much as any short haired breed but if we brush them regularly, we won’t find their hair on our furniture etc. They are not Retrievers, so fetching a ball is not their game. Walk, run, jog, jump and tug of war with a twisted rope and of course a nice stuffed Kong toy is wonderful. Foxhounds eat well and generally do not under-eat. Some are fussy and will only eat what they want, while others eat their bowl of food and would want food from the rest of the pack as well. 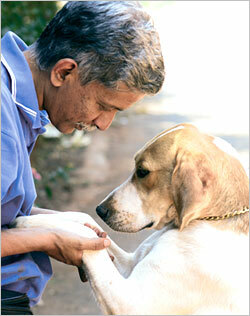 We feed them a mixture of good quality dog food, cooked ragi or rice, curds, vegetables and meat. They love this mush and thrive on it. We also add Rice Bran Oil and powdered Flax Seed for Omega 3. They get Vitamins supplement couple of times a week. The Foxhounds have no known congenital problems. Is English Foxhound the right breed for you? English Foxhound is for the people who’d like to have their dogs around them and have time to take them for walks and exercise. If you can let him be the member of the human family, he’s for you. If you have the patience to understand that these dogs are different and not stubborn, then he is the right dog for you because English Foxhounds are unique and very special animals. Their world view is distinctive and may be even Regal. And I think they should get the treatment they so rightly deserve!